*I’ve had to do some re-numbering with my Florida Discoveries posts, so instead of re-numbering everything, I just stuck a “0.5” in there. How many of you remember this video from Sesame Street? For years and years and years this was my perception of kayaking. Being sealed into this fiberglass tube-thingy as if you have no legs and navigating river rapids. And of course being able to flip around like this guy (allegedly Jim Henson) does at the end. Last week as a surprise for my sister and nephews, we borrowed a 2+ man ocean kayak from our friend/neighbor/former commander Mike D. This is different than the traditional, competition kayak that I was more familiar with (but had never done). I’d been canoeing many times — Girl Scouting, in college, in Louisiana on the Sabine River — but kayaking is somewhat different, and in many cases it was easier. 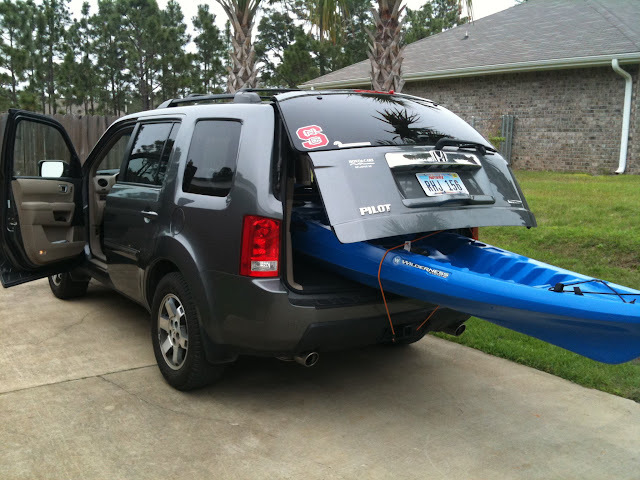 The first day we took the kayak out to Navarre Beach, we were mortified at how tall the waves were in the Gulf (it was chilly and windy), so we packed everything up and ran about 500′ across the parking lot to the Santa Rosa Sound side where things were much calmer! We all took turns taking short trips out. After my sister’s family left last weekend, we took a trip to the beach again, this time so Dave and the kids could try out the kayak. The gulf side was nice and calm, and we all got a chance to paddle out towards the dolphins! Here are pictures from our two kayaking trips. I believe it was a 130″ long kayak (just under 11′). So here’s how it looked packed into our suddenly-small-looking SUV. Luckily we were only transporting it about 5 miles, or 10 minutes drive. My oldest nephew, who was a champ helping us carry this thing around. It’s about 80 lbs. so two people can lift it easily enough, but it’s so large it wasn’t as easy as we thought. Our first trip out. My oldest nephew and me. Thanks to my sister’s awesome camera, it looks like she was in the water with us! My sister showing a little leg, with her two oldest sons. A younger kid could sit between two adults. That’s the Navarre Bridge behind them. But THIS is my favorite in the bunch. When I asked her to “SMILE”, we got this smile that reminds me so much of our Dad’s smile! This is Dave and Jacob taking a trip out about 5 days later. With just the four of us, we had to take turns with one of the adults staying ashore. This was out in the gulf, so there were more significant waves. When Timmy and I went out next, Timmy LOVED when the boat would crash head-on into a wave. Unfortunately, when we went out several hundred feet, where it gets really QUIET, Timmy got nervous and asked to go back to shore. When Dave and Jacob were first heading out, Timmy wanted to chase after them. This is about the point where Timmy realized that wasn’t such a good idea. For some reason, I just feel the defeat in this picture.